For other uses, see Steerage (ship) and Steerage (disambiguation). Steerage is the lower deck of a ship, where the cargo is stored above the closed hold. In the late 19th and early 20th century, steamship steerage decks were used to provide the lowest cost and lowest class of travel, such as for European immigrants to North America and Chinese emigrants. With limited privacy and security, inadequate sanitary conditions, and poor food, steerage was often decried as inhumane, and was eventually replaced on ocean liners with "third class" cabins. Traditionally, the steerage was "that part of the ship next below the quarter-deck, immediately before the bulkhead of the great cabin in most ships of war, also identified as the portion of the 'tween-decks just before the gun-room bulkhead. The name originates from the steering tackle which ran through this area to connect the rudder to the tiller or helm. In some ships the second-class passengers are called steerage passengers. The admiral's cabin on the middle deck of three-deckers has been called the steerage." The steerage area of the ship was once used to accommodate passengers, often placing hundreds together in a single large hold. Beds were routinely long rows of large shared bunks with straw mattresses and no bedding. ...the 900 steerage passengers crowded into the hold of so elegant and roomy a steamer as the Kaiser Wilhelm II, of the North German Lloyd line, are positively packed like cattle, making a walk on deck when the weather is good, absolutely impossible, while to breathe clean air below in rough weather, when the hatches are down is an equal impossibility. The stenches become unbearable, and many of the emigrants have to be driven down; for they prefer the bitterness and danger of the storm to the pestilential air below. The division between the genders is not carefully looked after, and the young women who are quartered among the married passengers have neither the privacy to which they are entitled nor are they much more protected than if they were living promiscuously. The food, which is miserable, is dealt out of huge kettles into the dinner pails provided by the steamship company. When it is distributed, the stronger push and crowd, so that meals are anything but orderly procedures. On the whole, the steerage of the modern ship ought to be condemned as unfit for the transportation of human beings...Take for example, the second cabin which costs about twice as much as the steerage and sometimes not twice so much; yet the second cabin passenger on the Kaiser Wilhelm II has six times as much deck room, much better located and well protected against inclement weather. Two to four sleep in one cabin, which is well and comfortably furnished; while in the steerage from 200 to 400 sleep in one compartment on bunks, one above the other, with little light and no comforts. In the second cabin the food is excellent, is partaken of in a luxuriantly appointed dining-room, is well cooked and well served; while in the steerage the unsavory rations are not served, but doled out, with less courtesy than one would find in a charity soup kitchen. The steerage ought to be and could be abolished by law...On many ships, even drinking water is grudgingly given, and on the steamer Staatendam, four years ago, we had literally to steal water for the steerage from the second cabin, and that of course at night. On many journeys, particularly on the SS Fürst Bismarck, of the Hamburg American Line, five years ago, the bread was absolutely uneatable, and was thrown into the water by the irate emigrants. In providing better accommodations, the English steamship companies have always led; and while the discipline on board of ship is always stricter than on other lines, the care bestowed upon the emigrants is correspondingly greater. ^ Smyth, William Henry; Belcher, Edward Hanks (1867). The sailor's word-book: An alphabetical digest of nautical terms, including some more especially military and scientific ... as well as archaisms of early voyagers, etc. London: Blackie and Son. p. 654. ^ Gjenvick, Paul K. "Steerage Class - Immigrant's Journey | GG Archives". www.gjenvick.com. Retrieved 2017-04-05. ^ Heritage, Norway. 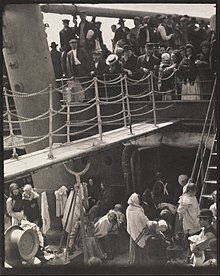 "Steerage Passengers - Emigrants Between Decks". www.norwayheritage.com. Retrieved 2017-04-05. Steiner, Edward A. (1906): On the Trail of the Immigrant, Fleming H. Revell Company, New York, © 1906, Fifth Edition. Chapter III, The Fellowship of the Steerage, Pages 30–47 GGA SDC 1555046572. This page was last edited on 10 January 2019, at 13:18 (UTC).